Depositing $50,000 at an online casino safely can be achieved by wiring the money or using an e-wallet service. Online punters have more options than ever when depositing money at online casinos, but that doesn’t mean every casino is safe and secure. The casinos we recommend are all safe and protected by stringent security measures and allow large deposits via multiple payment methods. While each of the casinos we recommend will require you to facilitate bank transfers and e-wallets transactions of $50,000 via your computer, they all have multiple platforms meaning you will be able to enjoy your gaming experience on your smartphone or tablet. Why not just use a credit card or debit card to make your deposit you ask? Because there is limits on these types of transactions and we’re trying to deposit $50,000. That’s why we use a service like a bank transfer. 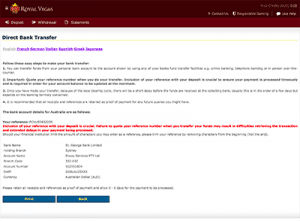 How to make a direct bank transfer at Royal Vegas Casino. To begin a bank transfer or money wire to a casino you will need to have signed up at where you want to play. While we recommend the above casinos because they cater for multiple currencies, have been tested for safety measures and allow “local bank” deposits, these guidelines are applicable for most online abodes. Step 1: Go to your chosen casino’s banking section and look for ‘Deposit Methods’. They will give you a list of instructions including a reference number and bank account details. Step 2: You then need to make the transfer via one of your bank’s method. E.g. online banking, telephone banking or at the actual bank. Transferring $50,000 will probably mean that you will need to do the transfer via phone or at the bank because most bank accounts have caps on their online banking. Step 3: Just to emphasise how important this is I’ve given it a step of its own. DON’T forget to put your reference number (you will have been given this when you get the casino’s bank account details) on the transfer. If you transfer money to a casinos bank account with no reference number on it could result in a delay on deciding whose funds they are. Step 4: Play the waiting game. Because the transfer needs to be cleared by the bank it can take up to a few days for the money to show up in the casino’s bank account. But as soon as the casino receives your money it will appear on your balance. If you’re transferring to an overseas account it can take longer. Step 5: Keep notes or even screenshots of any important receipts and references you are given in case you do forget to do something like put a reference number on your transfer. 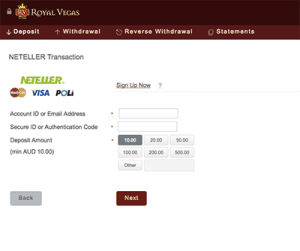 Neteller is also available at Royal Vegas Casino. Depositing $50,000 via an e-wallet such as Neteller or Skrill is also possible. Each of our recommended casinos has these two methods, although they are not available to players from all countries, so be sure to check your eligibility before signing up for a web wallet account. E-wallets can be best described as your online wallet – you can quickly and efficiently deposit and withdraw funds into your online casino accounts. This is also great because it allows you to store your money online in a place where it can be transferred quickly. Here is a step by step guide to depositing $50,000 at an online casino using Neteller. While these instructions are specifically for Neteller the method is similar with other respected e-wallets. Step 1: You obviously need a Neteller account, and to have your Neteller account funded. E-Wallets can be funded in a number of ways including debit and credit cards, bank transfers or from another e-wallet. Another thing to be aware of is that you need to set your monthly limits on your Neteller account which can be done in settings. Step 2: Go to your chosen casinos deposit methods and choose Neteller as your deposit method in the banking section. It will ask you for your Neteller login details which you will have after signing up at Neteller. Step 3: You will also be requested to enter the amount you want to deposit. Because you have previously set the Neteller account’s limit to $50,000 or above enter the amount you wish to deposit. The transaction should take a matter of minutes. Several of our recommended casinos have outstanding rewards programs that will heavily benefit players who are depositing $50,000. Royal Vegas Casino is part of the Fortune Lounge Group of Casinos which boasts an extensive tiered rewards program, giving more points and in turn more benefits, to those players who are gambling more. Welcome bonuses vary from casino to casino and range from anything as low as $300 to unlimited first deposit bonuses. Check out the table above to see the welcome bonus for each individual casino. Encryption certificates are vital to ensure casinos are secure. It is only right that you should be concerned about banking security when you’re dealing with an amount of money as large as $50,000. Your concern should not really be with the bank transfer or deposit method, it should be on where you are sending your money. The casino you choose should have a bank account, and if you must play at a casino that does not have a local bank account, be sure to do your homework to ensure the site is safe. We can’t stress enough that it’s important to play at secure casinos that are protected by adequate security measures. Each of our recommended casinos uses the latest SSL encryption which is the same as the major banks use for their online banking systems. It’s also important to make sure you’re on a secure internet connection when you’re doing banking transactions, for instance you would be stupid to access your e-wallet or online banking through the WiFi connection at a shopping centre. Looking for a safe online casino site that accepts deposits via bank transfer? We recommend Raging Bull Casino as our top-rated casino site for players from United States, which has some excellent welcome bonuses available for new players who deposit real money for the first time.